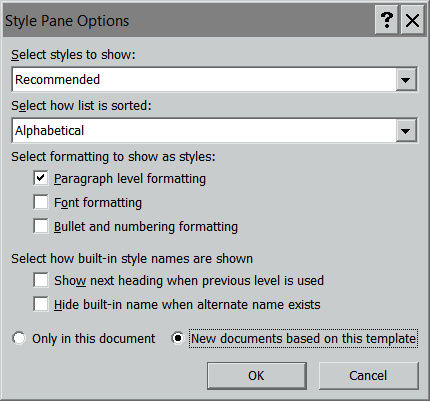 They make it possible to reformat a whole document simply by redefining styles or applying a different template using those styles. They make it possible to find and replace only text using a certain style. For example, you might want to find source citations by searching for parentheses in text styled as block quotations. They make it possible to generate a table of contents based on specified styles. So styles are very useful. 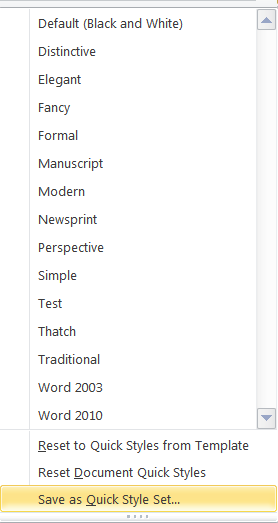 The problem is that Microsoft Word, in its usual “helpful” way, tries to manage which styles are available, in which document, and how those styles can be accessed. Finally growing tired of this nonsense, I decided to take the matter firmly in hand by writing this article. Right-click the icon (such as that for Strong). 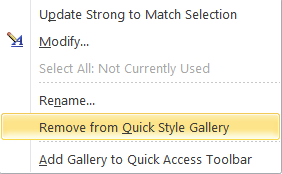 Click “Remove from Quick Style Gallery” (which, evidently is what the Styles area is called). Shoot, Strong is back again. So we can conclude that removing a style from the Quick Style Gallery applies only to the document in which we remove the style. But I’d like to get rid of Strong once and for all. How can I do that? Now I should be able to click the drop-down arrow next to Strong and delete it, right? Nope. Word won’t let me. How annoying! Then I open the Normal.dotm template. 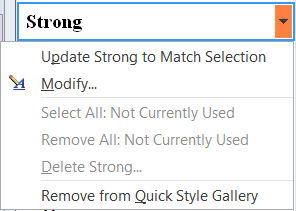 Now can I delete the Strong style? Open the Normal.dotm template, which is where your default styles are stored. 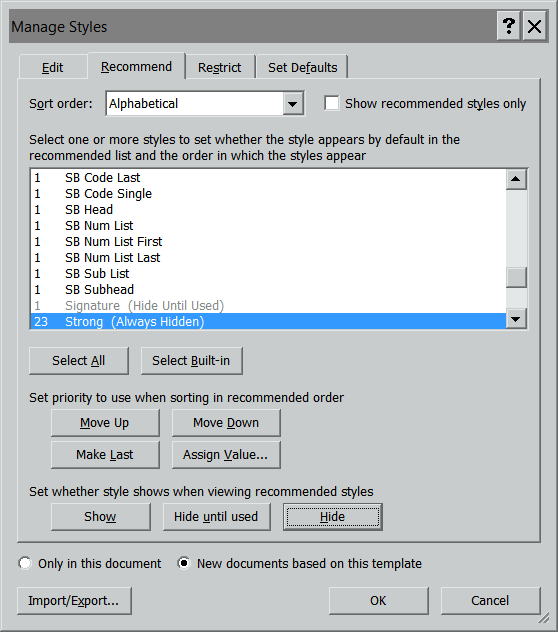 Make any other adjustments you’d like, such as the order in which the styles will appear in the task pane. Save and close the Normal.dotm template. After you’ve done that, every time you start Word or create a new document, you’ll get only the styles you want to see. I think. I hope. Maybe. How about you? Do you have any helpful hints about how to tame Word’s styles? If so, I’d love to hear from you.